Gregor Wurst kindly e-mailed me this afternoon, to tell me that (hooray!) the critical edition of the Tchacos Codex is published. Here is the link to Amazon if you want to purchase it as a very discounted price. 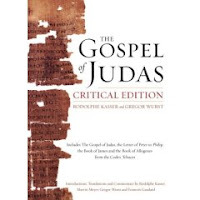 The book is called The Gospel of Judas, Critical Edition: Together with the Letter of Peter to Phillip, James, and a Book of Allogenes from Codex Tchacos. Finally the photos are published. For the first time in a single volume, discover the complete text of Codex Tchacos—the remarkable ancient papyrus book that contains the Gospel of Judas. Hidden for 1,600 years in an Egyptian cave, only to be found, traded, and all but destroyed before its restoration began in 2001, Codex Tchacos contains four texts that shed important light on the ancient world and the emergence of Christianity. Featuring beautifully rendered, full-color photographs of the original papyrus pages alongside the Coptic text and its English translation, this critical edition provides everything needed for a full examination of the Codex. The Letter of Peter to Philip provides a mystical, Gnostic picture of Jesus; the text entitled James presents Jesus discussing the meaning of life and death with his brother James; the Gospel of Judas casts a new light on Judas' betrayal; and the previously unknown book of Allogenes, though fragmentary, portrays Jesus as a stranger who brings light to a world of darkness. Ideal for the scholar and layperson alike, these texts are published here by an international team of scholars and supplemented by insightful introductions, indices, and other revealing, explanatory essays. "Book Note", "Gospel of Judas"